I've made this 5 or 6 times this year and it's always a little different depending on what I happen to have. 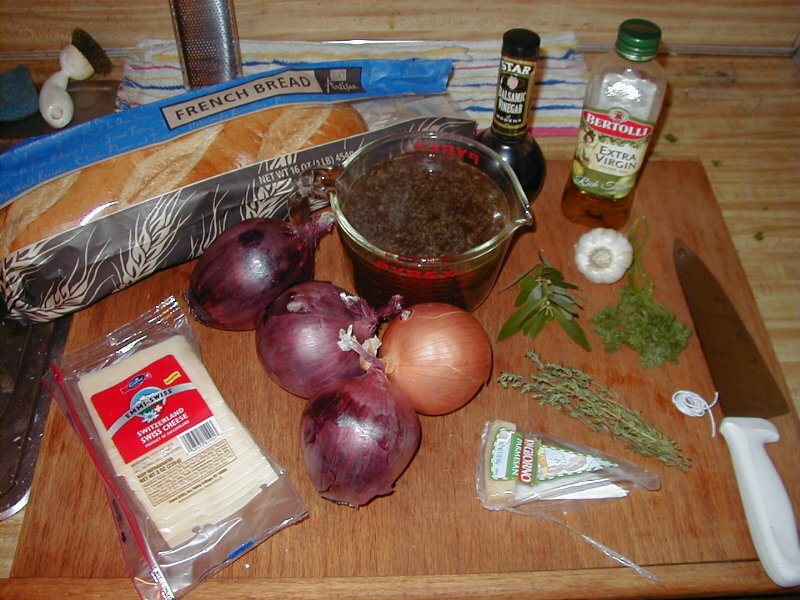 I had just about everything on hand except red onions and cooking sherry, so I went to the store. I forgot the cooking sherry. 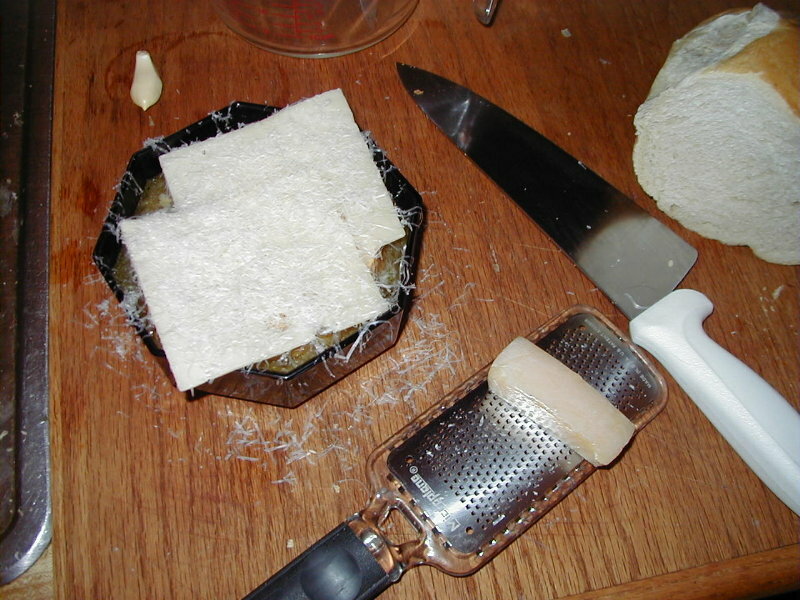 Rather that go back to the store, I took a calculated risk and used balsamic vinegar and extra thyme. 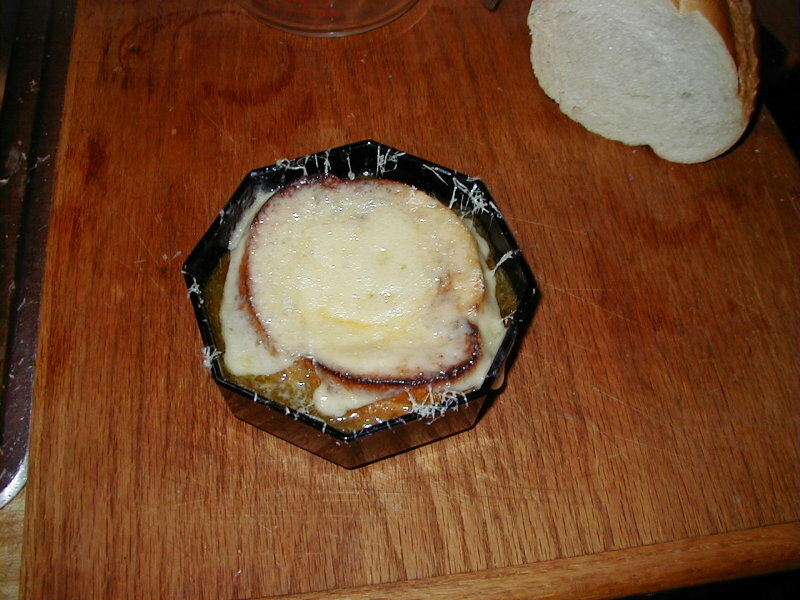 It has an interesting flavor...not the traditional french onion soup, but very good if you like these flavors. It pays to be adventurous. 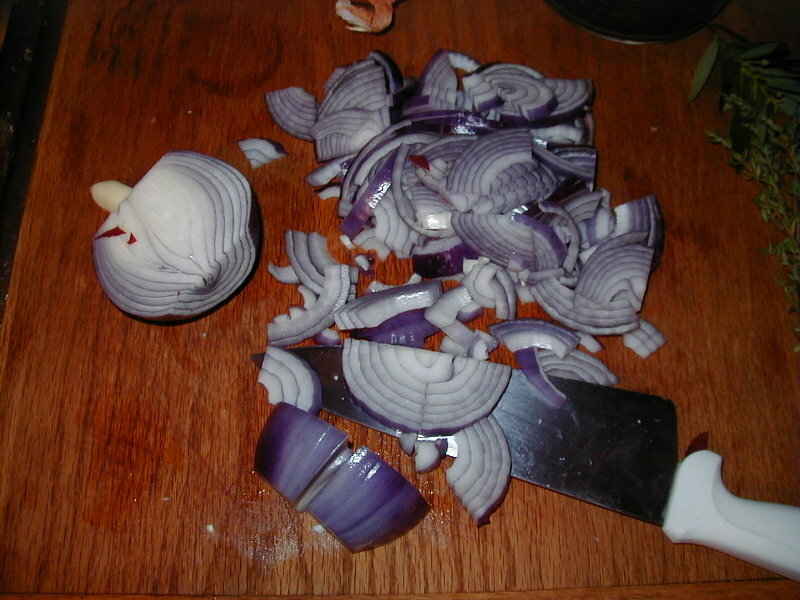 One of the red onions was bad (moldy) so I only used two, but they were big red onions. 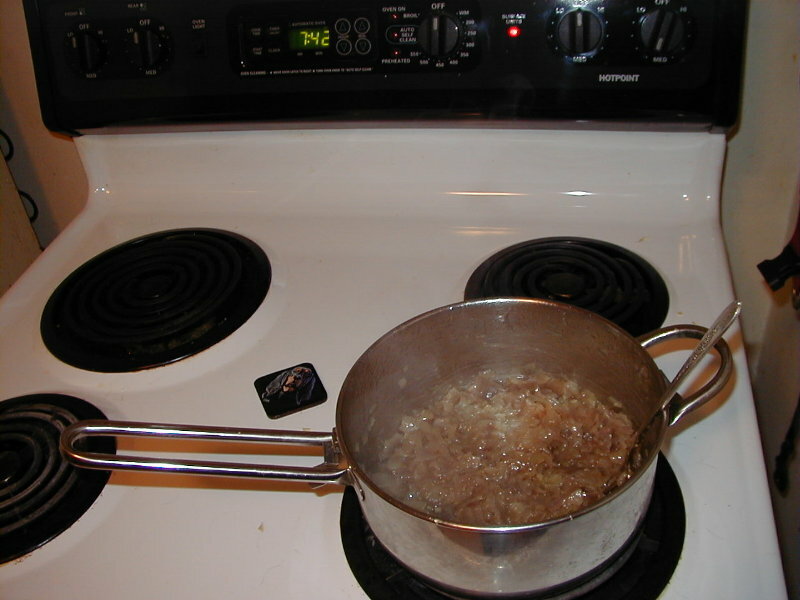 Pour a little oil in a pan and put it over a medium heat. 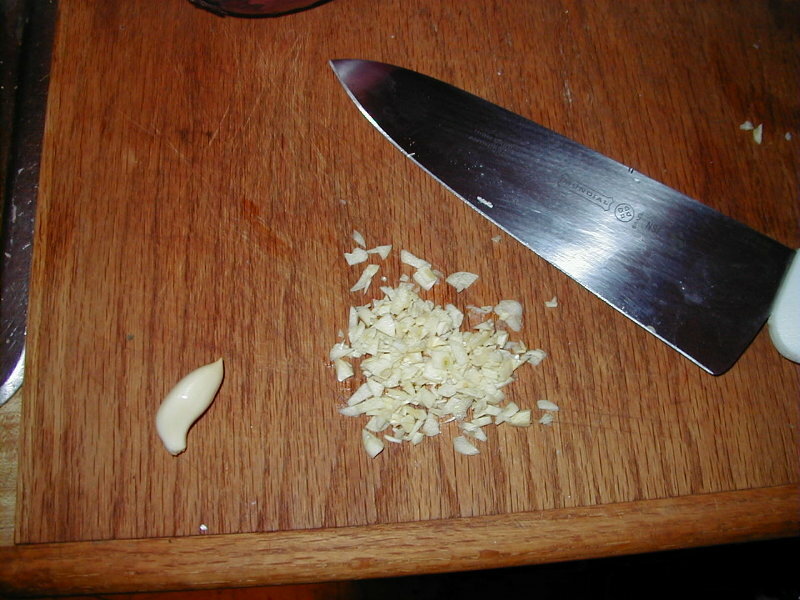 Chop up some garlic and throw it in. 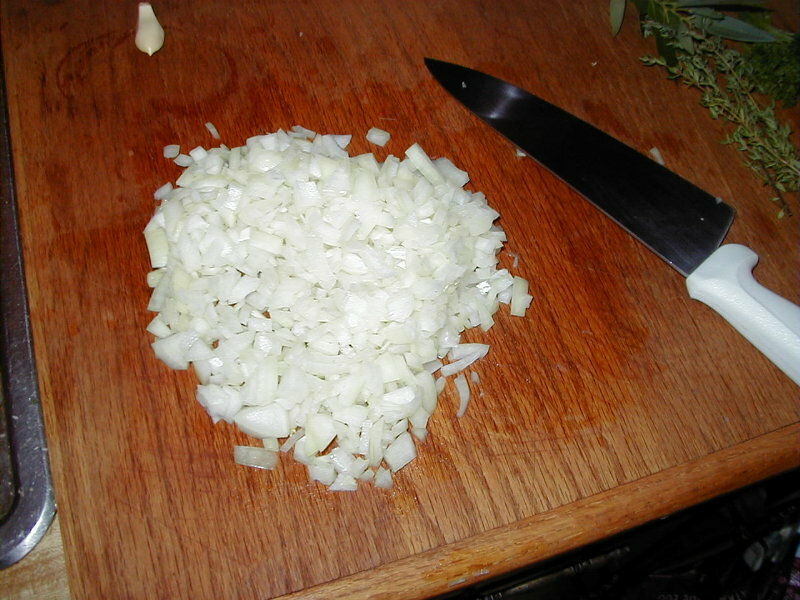 Chop the onions as shown, so you get quarter round pieces. 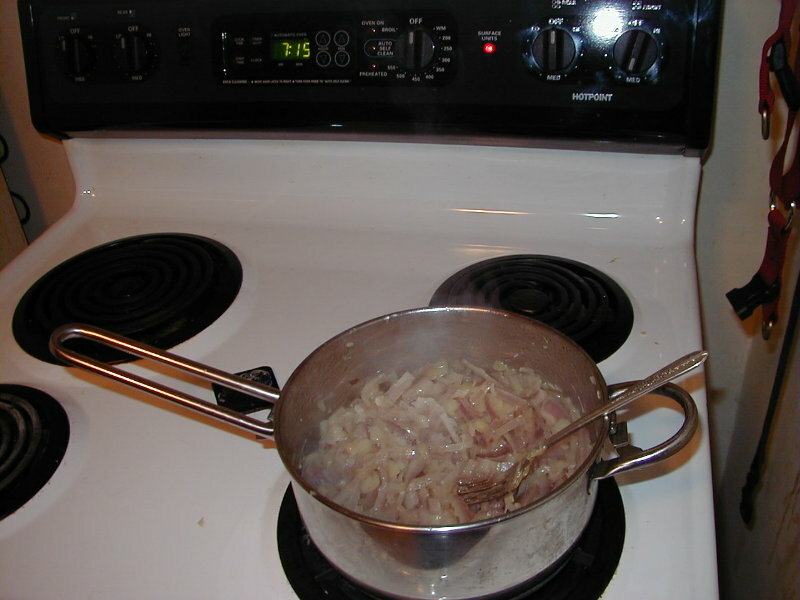 Throw them in the pot with the garlic and stir it up. 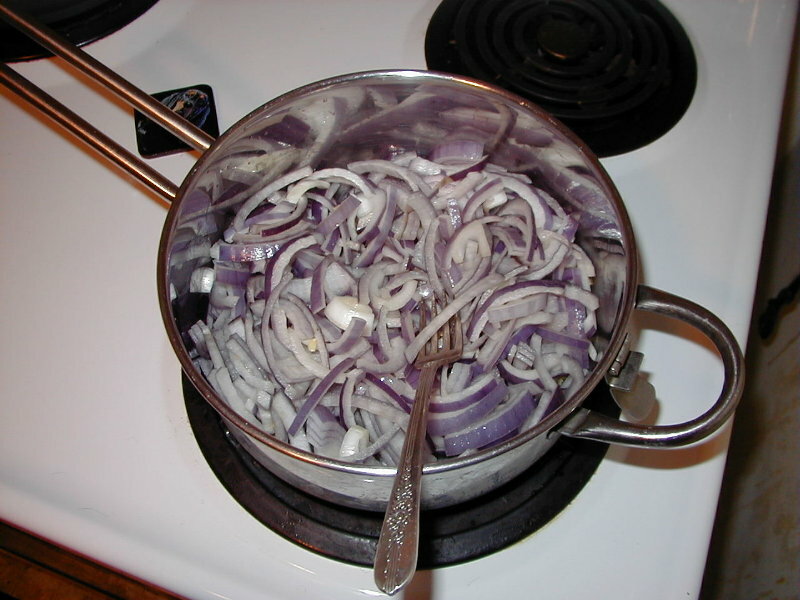 Thats a lot of onions! But its not enough! 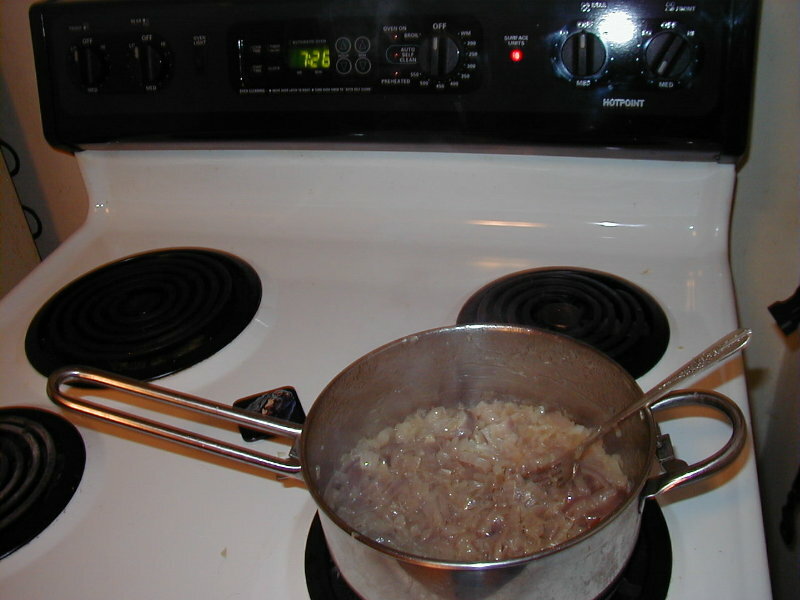 Chop the sweet onion into little bits as shown, then throw them in the pot, too. 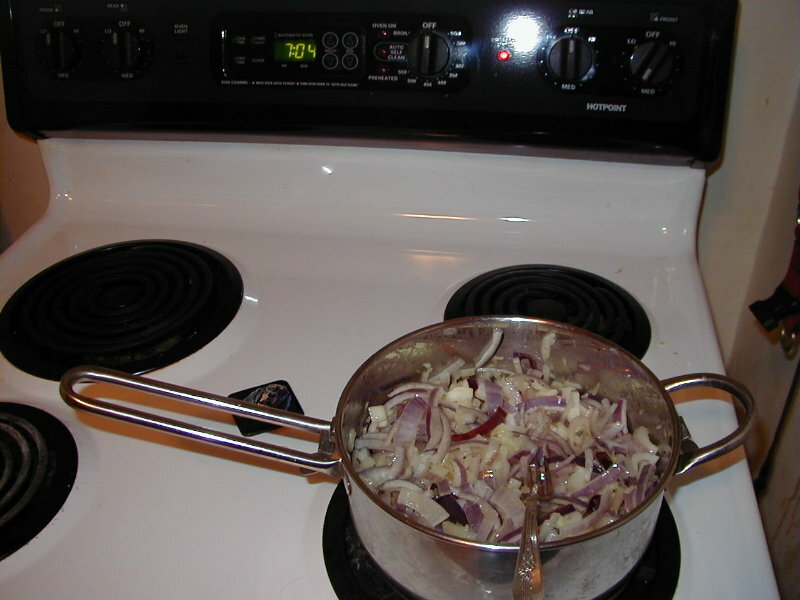 Start cooking the onions down over a medium to medium-low heat. It takes awhile. Keep stirring them! They are not done yet! Keep stirring them! They are still not done yet! 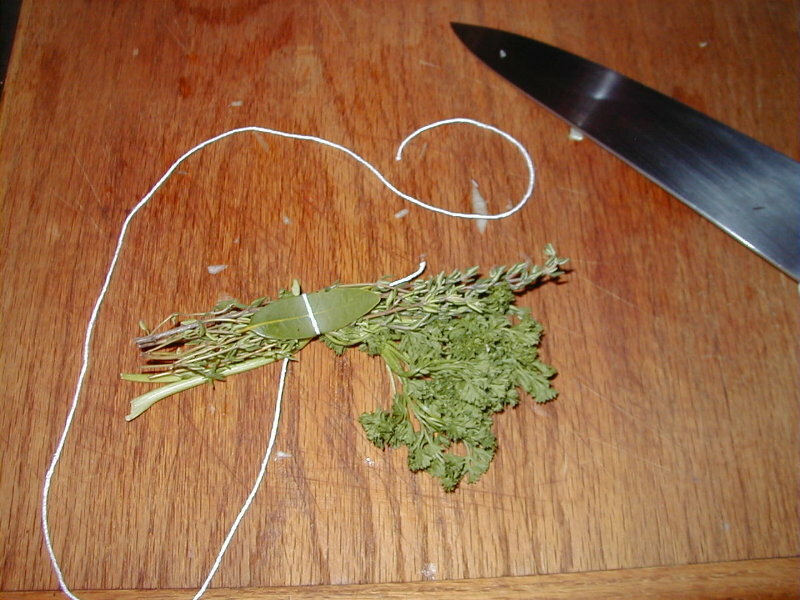 Bundle your bay leaf, thyme, and parsley together with some string. The string out of tampons works good. This is probably a lot of thyme. NOW it is almost done. See how it has turned dark brown and carmelized slowly? Its not done until it is at least this dark. Pour in your beef stock and toss in the herbs. 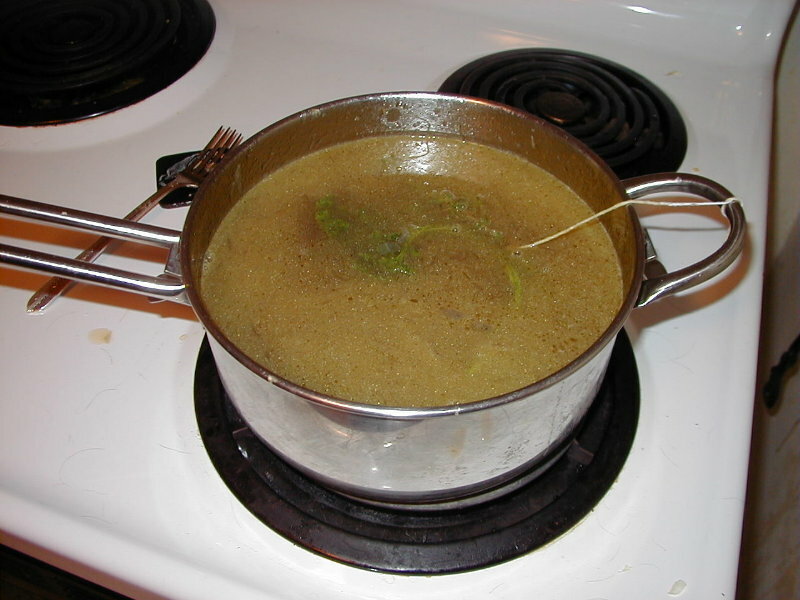 Simmer for 15-20 minutes and remove the herbs. 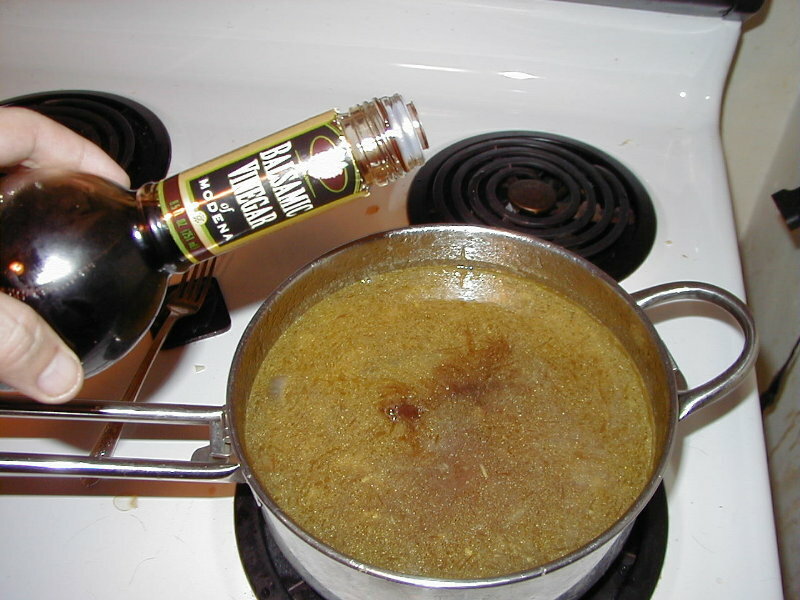 Add about 2 tablespoons of balsamic vinegar and stir it in. Mmmm! Smells good! 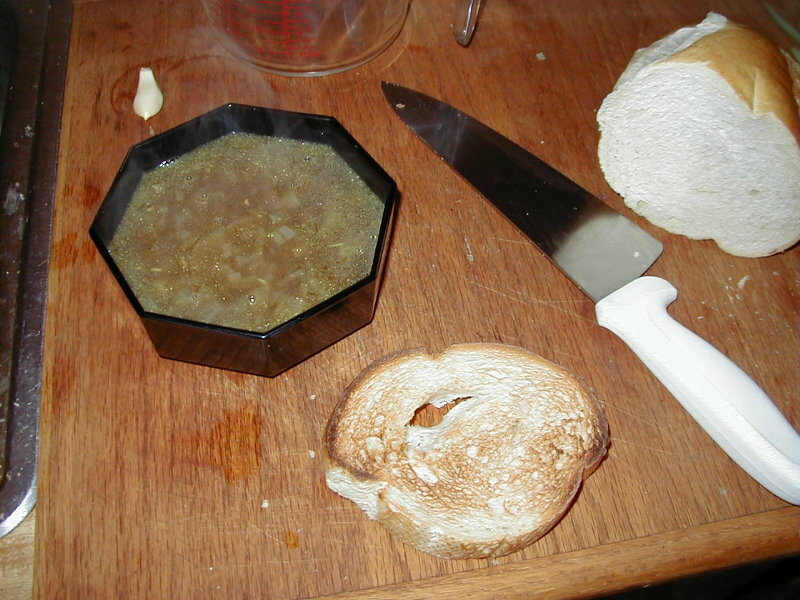 I dont have a proper onion soup crock, but you dont eat that part anyways.